It is well-known that the major Canadian political parties now use political marketing tools to segment the electorate and target specific groups of voters. According to a new study appearing in the journal Heliyon. published by Elsevier, positional issues play a greater role in Canadian electoral politics than previously assumed. By measuring aggregated responses to multiple statements around national and regional issues, the analysis found that many voters take unambiguous positions along ideological lines. The investigators of this research project are Yannick Dufresne, Ph.D., Leadership Chair in the Teaching of Digital Social Sciences, and Assistant Professor of Political Science at Université Laval, Quebec City, QC, Canada, and Catherine Ouellet, Ph.D. candidate in Political Science at the University of Toronto, ON, Canada. They explain that "while the effects of positional issues might only explain a small percentage of overall electoral changes, small percentages can be decisive in determining the winner of an election." Canadian electoral politics have traditionally engaged in brokerage style politics, where parties avoid pronouncements on divisive issues that might exacerbate tense social cleavages. As a result, the parties end up competing on non-polarizing valence issues, such as the need for a strong economy and clean environment, and do not address the means by which these ends would be achieved, focusing on the "who" and the "what" rather than the "how." One explanation for this electoral behavior is the heterogeneity of Canada's socio-demographics and values where parties could easily risk alienating segments of the highly fragmented electorate. This study differs from previous research because it considers aggregated opinions on related issues, rather than looking at each dimension individually. Using data from the 2004, 2008, and 2011 Canadian Election Study, researchers were able to create eight positional issue scales by grouping the responses to consistently worded statements answered at four-year intervals. The broad positional issue categories included the economy, environment, foreign/US relations, law and order, minority issues, moral issues, social programs, and women's issues. The responses represented a spectrum of positions advocating free market economics and environmentalism versus more regulation, closer ties versus less engagement with the US, stronger social safety net versus program cuts, nationalism versus globalism, and flexible versus traditional values. These issue scales were used to compare the effects of positional issues to rival predictors of vote choice. The results show that conceptualization and measurement of positional issues through multi-items scales demonstrate both stability and significant effect on vote choice. 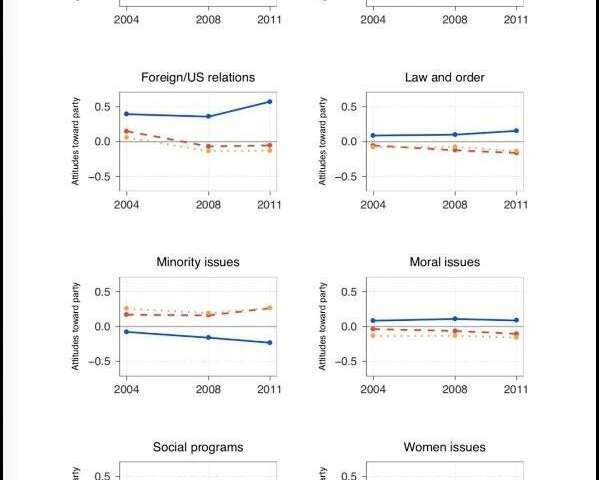 The significance and strength of issues are found to be comparable to more conventional predictors of vote choice like values and party identification. "The more items in a scale, the more opportunities to capture citizens' real attitudes," explained co-investigator Catherine Ouellet.